On 27 February 2015 Boris Nemtsov was shot dead on the Moskvoretsky Bridge near the Kremlin in Moscow. "The assassination of Boris Nemtsov, a Russian statesman and politician opposed to the government of Vladimir Putin, happened in central Moscow on Bolshoy Moskvoretsky Bridge at 23:31 local time on 27 February 2015. 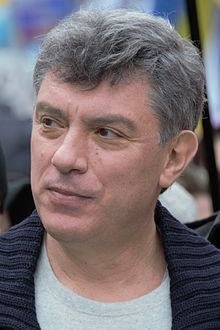 An unknown assailant fired seven or eight shots from a Makarov pistol; four of them hit Boris Nemtsov in the head, heart, liver and stomach, killing him almost instantly. He died hours after appealing to the public to support a march against Russia's war in Ukraine. The assassination was met with widespread international condemnation and concern for the situation of the Russian opposition. Russian authorities also condemned the murder and vowed a thorough investigation. On 8 March 2015, Russian authorities charged Anzor Gubashev and Zaur Dadaev, both originating from Northern Caucasus, with involvement in the crime. Dadaev confessed to involvement in the murder according to Russian authorities, but, according to Russian media, later retracted his confession. Three more suspects were arrested around the same time and according to Russian media another suspect blew himself up in Grozny when Russian police forces surrounded his apartment block. "Less than three weeks before his murder, on 10 February, Nemtsov had written on Russia's "Sobesednik" news website that his 87-year-old mother was afraid Putin would kill him. He added that his mother is also afraid for former oligarch Mikhail Khodorkovsky and anti-corruption activist Alexey Navalny. When asked if he himself was afraid for his life, Nemtsov answered, "Yes, not as strongly as my mother, but still..." In an extended version of the interview Nemtsov reportedly added, "I am just joking. If I were afraid of Putin, I wouldn't be in this line of work." Two weeks prior to his assassination Nemtsov had met "with an old friend", Yevgenia Albats, editor of New Times magazine, to discuss his research into Putin's role in the Ukraine conflict. Albats said that Nemtsov "was afraid of being killed" but "was trying to convince himself, and me, they wouldn’t touch him because he was a [former] member of the Russian government, a vice premier, and they wouldn’t want to create a precedent. Because as he said, one time the power will change hands in Russia again, and those who served Putin wouldn’t want to create this precedent"."